Young Professionals and Young Couples (20s, 30, and 40s), please join us on Thursday, February 7, 2013 at 7:00 PM in the Wiener Social Hall for an exciting evening of wine and beer tasting with Rabbi Litwak and Rabbi Young. This is an opportunity to get to know other young professionals in the community, while learning about different wine and beer. 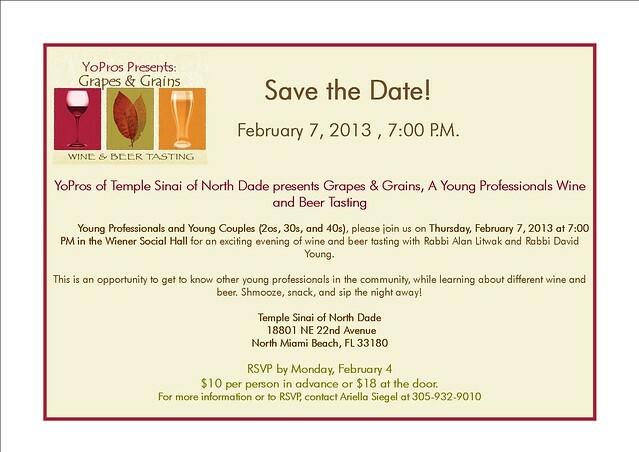 Shmooze, snack, and sip the night away at Temple Sinai, 18801 NE 22nd Ave., North Miami Beach, FL 33180. RSVP by Monday, February 4 at $10 per person for pre-pay or $18 at the door. Call 305-932-9010 to let us know you’re coming!